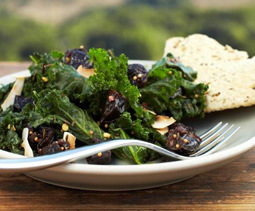 Sautéed Kale with Dried Plums and Coconut - A recipe from Savor California, the online showcase for extraordinary gourmet foods and beverages from California. Remove stems from kale and discard. Cut or tear kale into bite-size pieces; wash and drain (do not dry in a salad spinner; there should be some moisture clinging to the leaves). In a large skillet, heat coconut oil over medium heat. Add mustard seeds; when they start to pop, add cumin seeds and toss for a few seconds. Add dried plums, ginger and pepper flakes; after ginger sizzles for a few seconds, add kale. Cover skillet and cook 3-4 minutes or until kale wilts but is still bright green. Season with salt and mix well. Transfer to a serving bowl and sprinkle with coconut.